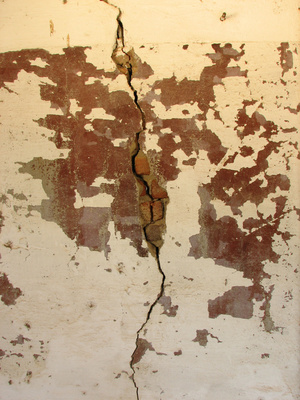 Many factors cause cracks in a basement floor. Cracks in concrete are a fact of life. Temperature changes, changes in pressure and settling of the ground underneath the concrete all contribute to cracks. Plus, concrete naturally shrinks as it cures and dries. In areas of the country where homes and other structures have basements, cracks in the concrete basement floor are common. Most areas where basements are common--at least in the U.S--are far removed from coastal areas, which means they are far more likely to experience wide variations in temperature, from searing summers to freezing winters. The constant change in temperatures causes the concrete in the basement floor to expand (when it's warm) and contract (when it's cold). Over time, this can lead to cracks in the floor, especially in unfinished basements that aren't heated and insulated well. Settlement is a common cause of cracks in basement floors and can be caused by many things. If the soil under the floor is not compacted properly, it can shift and cause cracking. If moisture gets under the home, it can cause the soil to expand and then contract when the moisture dries up. This expansion and contraction puts pressure on the concrete floor, eventually leading to cracks. Basement floors can also crack from settling of other components of the house, such as lumber used in framing or metal posts used for support. Concrete naturally shrinks as it cures. Tim Carter, a nationally syndicated newspaper columnist and founder of Ask the Builder, says concrete can shrink as much as 1/16 inch for every 10 feet poured. This can lead to hairline cracks in a basement floor. Carter says the most common places to find these cracks are at 90-degree corners, such as at wall intersections. These cracks generally are not a concern, unless they lead to other problems, such as moisture seepage.